Ryan Stone is a less than average teenager. He doesn’t have fancy clothes. He doesn’t carry around the latest smartphone and he definitely doesn’t have an MP3 player. Instead, he goes to school, does his chores and dreams of a new life away from Brookfield where he’s expected to follow in his blue collar family’s footsteps. Hadley Carter is America’s Pop Princess. A successful recording artist living her dream with a sold out tour and a handful of Grammy’s there isn’t much that she wants for, except love. But finding love on the road is near impossible when all she longs for are romantic dinners, a nighttime stroll on the beach and holding hands with someone who isn’t going to exploit her. When a chance encounter introduces Ryan to Hadley, will he be like her adoring fans looking for a way in, or will it be Hadley who pursues Ryan even though it might cost her the only career she's known. Hadley is beautiful, down to earth and lives for her fans that made her the successful music celebrity that she is today. So when her tour stops in Jackson, she never expected her life to change forever. After winning a radio competition, Ryan is dragged along to the Hadley concert with best friend Dylan. Ryan doesn't even own a radio, brought up by devout religious parents with an abusive father. He's never had a girlfriend, he's never been kissed. So when he meets the pop superstar backstage at her concert, he has no idea who Hadley is. The two are from completely different worlds, she is loved by millions and has never needed to go without. Ryan's parents barely recognise his presence and his only real friend is Dylan. The biggest difference? Hadley is 22... Ryan is only 17 and still in high school. They can't help but gravitate towards one another, neither wanting to walk away from the forbidden relationship. Hadley knows that she is waking in dangerous ground, one whisper and her career would be damaged beyond repair. Why does loving someone so right, feel so utterly wrong? Ryan and Hadley had an instant connection, instant warmth and electrical currents upon contact. He's shy and retiring, she lives in the spotlight. He's underage, but she still cautiously pursues him. It's the ultimate forbidden love. I enjoy Heidi McLaughlin's simple story lines. Her characters aren't complex, so it takes nothing away from the book itself. She has almost created her own genre of fantasy romance, minus the supernatural element. Situations that are unrealistic, so the reader can invest in her novels and enjoy being taken on a journey. Like a Harlequin novelist of the young adult generation, always well written and heartwarming endings. My grandma once told me that I can do anything I want, so I am. Originally from the Pacific Northwest, I now live in picturesque Vermont, with my husband and two daughters. Also renting space in our home is an overhyper Beagle/Jack Russell and two Parakeets. During the day you'll find me behind a desk talking about Land Use. At night, I'm writing one of the many stories I plan to release or sitting courtside during either daughter's basketball games. I'm also an active reviewer on The Readiacs - a site I own with my best friend. Check out the Facebook page HERE for prize giveaways to celebrate the release. Thank you for so much for the review and participating in the tour. This is my first time to your site and I love it. You've created a very inviting format. I hope to work with you again! Hi Heidi and thanks for dropping by. I really enjoyed Lost In You and looking forward to the release of My Unexpected Forever. Hi Beverly and thanks for your comment. If you like fun, light hearted, young adult romances, you'll love this one. Hi Jess, and thanks for stopping by. It was a fun read. I like Heidi's writing style and her storlines, they are mostly fluffy and heartwarming. She's a definite 'go to' author if your looking for a warm & fuzzy romance. 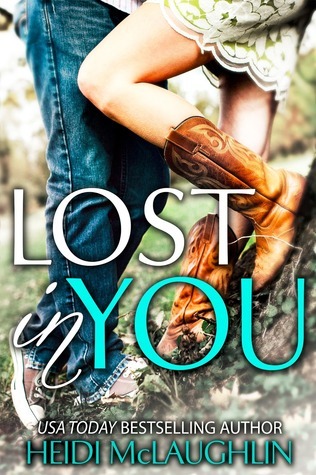 Love all of Heidi's books, cannot wait to get stuck into "Lost in you"
You'll be sure to love this one. I love Heidi's style of writing. She's the modern young adult version of the classic Mills and Boon and Harlequin novels that our mothers would read. The book sounds great, can't wait to pick up my copy. The cover is gorgeous! Oh, I love those boots! Reading through, Hadley reminded me of a well known sweetheart country singer, the one where the media likes to constantly discuss her love life. See if you can see the comparison too. The book sounds so good! I can't wait to read it **squeel!